Accurate metacognitive monitoring of one’s own knowledge or performance is a precondition for self-regulated learning; monitoring informs metacognitive control, which in turn affects task outcomes. Studies of monitoring accuracy and its connection to knowledge and performance are common in psychology and educational research but rare in instructed SLA. This paper describes two studies in which actual performance and self-evaluated performance were compared. In Study 1, 64 college-level ESL learners completed L2 vocabulary tasks that differed in complexity and familiarity. Wide discrepancies in monitoring accuracy were observed. In Study 2, the same sample was divided into two groups, and the more complex task from Study 1 was used as a pre- and post-test. One group was given strategy instruction to improve monitoring accuracy. Metacognitive control was operationalized as choice of dictionaries used during the task, and effects of control on task outcomes were operationalized as points achieved on the task that could be attributed to use of a particular dictionary type. Results showed that control decisions leading to poorer task outcomes were associated with lower monitoring accuracy. 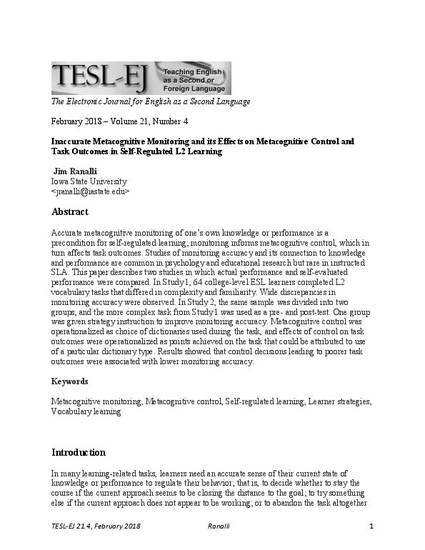 This article is published as Ranalli,J., Inaccurate Metacognitive Monitoring and its Effects on Metacognitive Control and Task Outcomes in Self-Regulated L2 Learning., The Electronic Journal for English as a Second Language. 2018, 21(4); Posted with permission.